You might be surprised to learn that Ray Stevens is one of my all-time favorite singer-songwriters. When I was but a wee lass, I listened to his greatest hits cassette tape (remember those?) until it no longer functioned. Mississippi Squirrel Revival. (Spoiler: The squirrel went berserk.) The Dooright Family. It's Me Again, Margaret. Gitarzan. Everything is Beautiful. I could just go on and on. Another of his ditties that I can still sing to this day is The Streak. I so often feel that way. If you're unfamiliar with the man (and most of you probably are) and in need of a chuckle, check him out! He also did a cover of I'm My Own Grandpa, which is simply one of the most hilarious and ingenious songs ever written. Speaking of streaks (brace yourselves for a tremendous segue! ), I'm pretty excited about these streaky sugar cookies. All I did was take regular sugar cookie dough, split it into 3 hunks, dye each hunk a different color, then knead and roll. Isn't it a nifty effect? 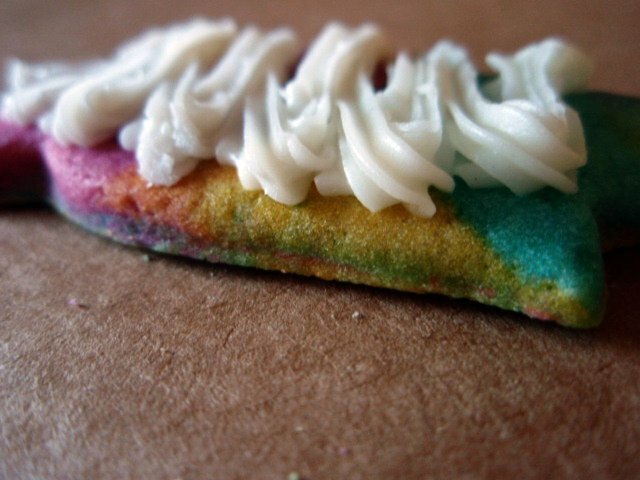 Have fun with it--every cookie in every batch you make will be unique! In a large bowl, cream together the butter and sugar until it is smooth. Beat in the eggs and the vanilla. Stir in the flour, baking powder and the salt. Divide the dough into four portions, shape each into a disk, wrap with plastic wrap and chill for at least 1 hour (or overnight). Remove one disk of dough from the fridge and split it into three balls. Add the food coloring to each of the dough balls, kneading it in just until desired color is achieved. Briefly knead the three colors together so that a swirl effect is obtained. Don't go too crazy or you'll end up with brown dough. Preheat your oven to 375 degrees F.
Roll out the now-colored dough (on a floured surface) so that it is 1/4- to 1/2-inch thick. Cut the dough into shapes with any cookie cutter. Place the cookies 1 inch apart on ungreased cookie sheets. Bake them for 6 to 8 minutes in a preheated oven. Cool them completely, then frost as desired. I have never heard of this man, but anyone whose music inspires psychadelic cookies is OK by me! How adorable! The icing looks really pretty. 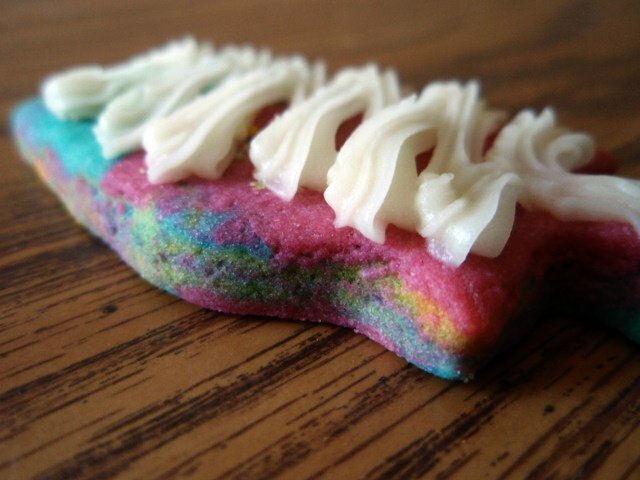 Tie-dyed cookies! These look so pretty! Totally inspirational. I can see where Ray Stevens fits in. BTW, those cookies look amazing! wouldn't they make fabulous ice cream sammiches? I love Ray Stevens. My favorite is Roger Miller, not really of my time, but another genius as well. I'll have to check Ray Stevens. The cookies look fun and tasty. tooo cute! I hope you enjoyed your weekend, my friend!! So cute, I really like them. Thanks for the trip down memory lane. I still can sing some of the lyrics as well. So funny. Love your streak cookies. very cool cookies. Love the vibrant colors! I love how colorful these are! The Streak! Thanks for reminding me of that. Great cookie name too. I love that each one is unique. Beautiful cookies!! !Love all the colors! My parents loved Ray Stevens and we listened to him on 8 Track and albums :) No matter how many times I hear his songs, they still crack me up :) I tried this recipe and it is definitely a keeper! Thank you!! What a fantastic idea -they look super yummy! I haven't thought about that song in ages! Love the cookies, and the segue. I was thinking about cassettes just last night...and wondered if I had any left, or anything to play them on if I did. Funny! The kids come home and take care of 45's (we have an entire box of those), cassettes, and LP's. They are forever organizing them. Your cookies look like a party! Grandkids would love to make these, Grace. Love these- absolutely must make! Smile. Isn't it fun to make treats based on art we love? These are lovely...full of life and color. Thank you for sharing them with me! I like anything with rainbows! Cool cookies, and very colourful! I think the colours on mine would all mush together, lol! I also grew up listening to Ray Stevens and still love to play the Mississippi Squirrel Revival song when I need a pick-me-up!! The cookies look great... I will pin them and make them real soon! Thanks for the laugh and the memories! How fun! These would be so wonderful to make for a party...people--even adults--can't resist something this colorful! 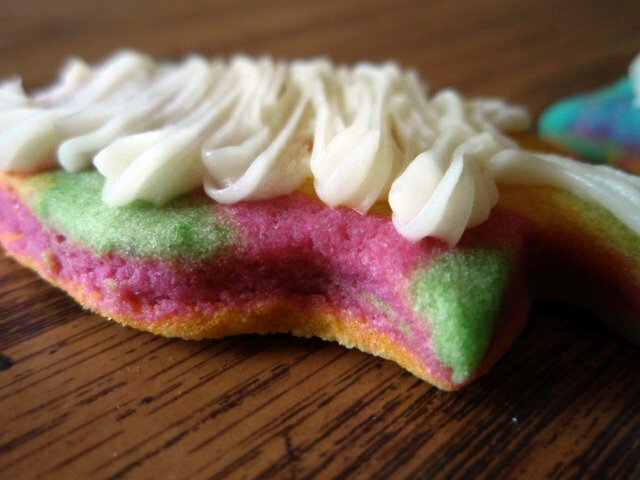 Love the tye dye look of these cookies! Ray Stevens is great too! I never heard of the man either but those cookies are indescribably awesome!!! P.S. I hope you don't mind that I Pinned your Goat Cheese Give-Away on my Goat Cheese Month Board. It's a really cool give-away; have FUN! 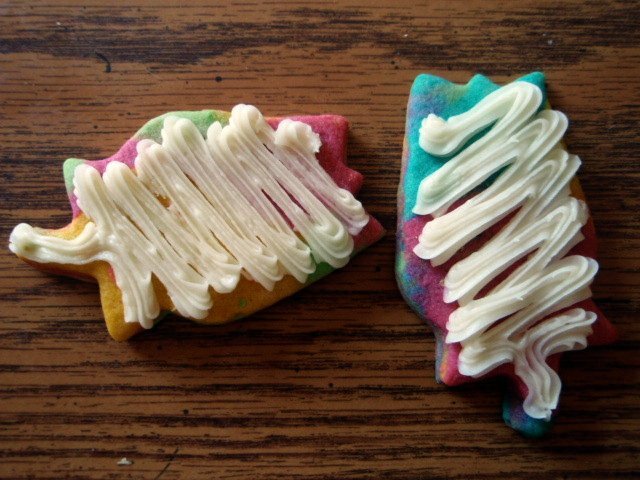 Love the idea of these cookies- so fun! Ray did have some cool songs and I do have old cassettes, just no way to play them!